CEREC Same Day Crowns: Why Wait Weeks When You Can Smile Today? Are you familiar with the frustration caused by a broken tooth or crown? Perhaps what hurts more than the pain and sensitivity of a broken tooth is the thought of having to go to the dentist multiple times until your final restoration is set in place. 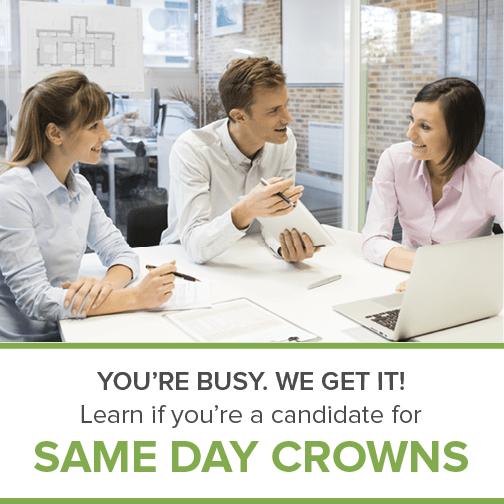 Wouldn’t it be nice to get your tooth or crown fixed on the same day? What if we told you that you can get a permanent, beautiful, highest-quality dental crown placed on your lunch break? With CEREC same day crowns, you can be in and out of our office with a complete and seamless aesthetic smile in no-time. Learn how this advanced CEREC digital and milling technology is revolutionizing the way we view dentistry in this fast-paced modern world. Beautiful tooth restorations faster than ever before! Being a parent, business owner, and musician, your dentist in Oak Lawn knows a thing or two about successfully managing a tight schedule. When it comes to oral health emergencies, such as a broken tooth or crown, time is of the essence. Waiting until the pain becomes unbearable and you are finally forced to get it fixed not only affects your work performance and mood, it could also mean losing your tooth. That would unleash a chain reaction of dental problems and a decline in confidence. With CEREC same day crowns, you no longer have to wait weeks to smile again. 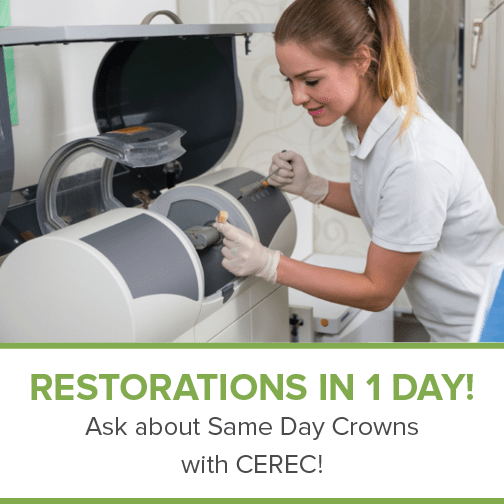 What is CEREC same day crown technology? Our CEREC dental technology makes dental visits super fast and convenient for those of us with busy schedules. CEREC (Chairside Economical Restoration of Esthetic Ceramics) is a CAD/CAM (computer-aided design/computer-aided manufacturing) technology used by your Oak Lawn dentist for creating same-day crowns and several types of dental restorations. This high-tech equipment can only be found only at a handful of the most advanced dental offices in the country. Free Infographic: Same Day Dentistry, How Does It Work? 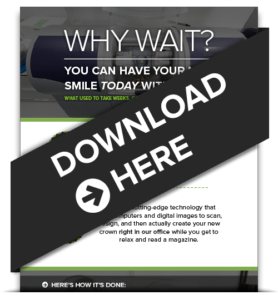 Download your free infographic to discover how CEREC technology can benefit your smile. Give me the free Infographic! Get your same day dental crown placed on the same day! We understand you don’t want to be in a dental office longer than you have to. If you or a family member has a chipped, cracked, or broken tooth or crown, contact us as soon as possible to find a fit in your schedule. Our same day crown technology and gentle techniques will make your visit quick and painless. Call us at 708-422-6116 to schedule an appointment on your lunch break or when most convenient for you.